The Big Beastly Adventure aka 2 Fat People in an RV: What were we thinking!? If you have lived in Vancouver for a certain time – in general less than half an hour – you know that there are some things you just don’t do on long weekends. You especially don’t do those things on sunny long weekend Mondays, when the throngs that went to the Fireworks, Seafest and the Gay Pride parade all decide to cram a few last minute touristy things into their agenda. 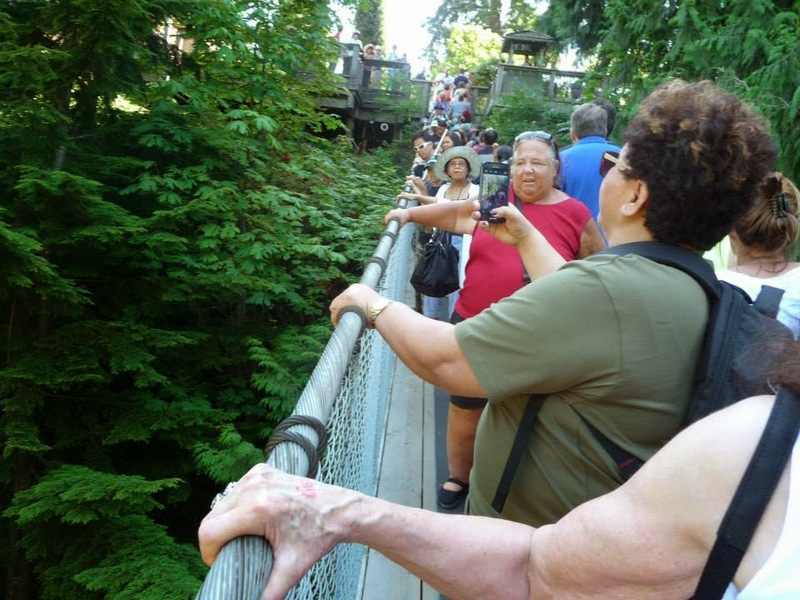 One of those things is taking a group of 15 people to one of the major attractions in the city….the Capilano Suspension Bridge. But, undaunted (motto: who the hell needs daunts), we boarded our trusty vehicles and off we went to North Vancouver where it took 2 hours to find parking for a one-hour tour. The pitifully inadequate parking lot was full to bursting and the still more pitifully inadequate staff were incapable of giving clear directions to the overflow parking (note: it’s behind a big green plastic fence, just past Edgemont village). But, after only an hour or so of standing in line, we made it to the bridge. 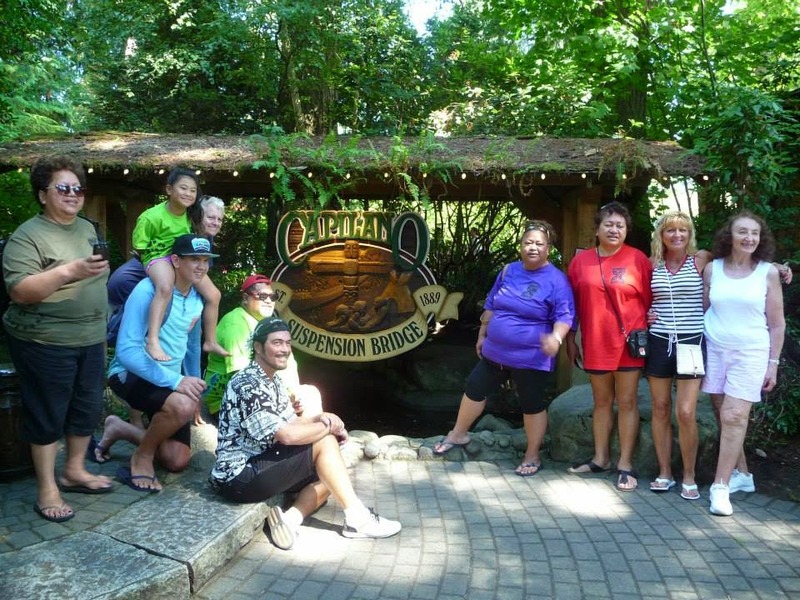 Now, at the best of times, that bridge moves….a LOT. When you add the weight and displacement of over 1000 people, it moves a WHOLE LOT. I was getting seasick. Some of the group took one look and went and sat down. Others went shopping. I don’t blame them. I made it to the end of the bridge and turned right around – I figured it was only going to get harder from then on. I wasn’t comforted by the sign that tells you that the bridge can hold 1300 people before the cables snap. Which 1300 people? How much do they weigh? What if number 1299 is hefty? Should we take ice cream away from the crowd before they get to the stairs? One extra calorie might make the difference between just puking over the rail or free-falling without a parachute. And if you’re going to limit the number to 1300, shouldn’t there be someone actually counting? I’m pretty sure we were maxing out at one point. Anyhow, we all made it out alive and went looking for lunch. Oddly enough, every restaurant around the place was closed. We wound up at a café at a church just as they were going to close. The poor server was plucky though and fed our group with whatever food she had left over. Our next destination was Grouse Mountain, where we learned there was a 3-hour wait for the gondola. We just gave up and went home. Sometimes, you just have to trust your instincts.